Hastings United Football Club has signed a player who manager Chris Agutter regards as ‘the best left winger in the league’ - and he is now hoping to bring in ‘the best right winger’. Youssouf Bamba put pen to paper with the Bostik League South East Division club on Monday and is expected to go straight into the side for the home Buildbase FA Trophy preliminary round tie at home to Whyteleafe on Saturday. 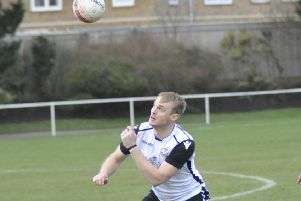 Agutter said: “We’ve got the best wide player in the league without a doubt - that’s a real statement signing I think. Agutter said a handful of other from a similar level to Hastings or higher were all interested in Bamba, but the 23-year-old Frenchman opted to make the move to The Pilot Field. Agutter was also hoping to recruit ‘the equivalent of Youssouf on the right’ in time for tomorrow’s encounter. Should that signing happen, Hastings will have five wingers in the squad and Agutter says at least two of their existing wide players will leave the club as a result. “We will obviously be trimming the squad,” he went on. “But what we will be doing is significantly strengthening. “As good as we have been in terms of as many goals as we’ve scored, I think we could’ve won more games five or six.